New Bond Brand Loyalty study shows consumers are evaluating their loyalty program experience on elements far beyond the dividend and rewards. Members who find their loyalty program to be enjoyable are 10 times more likely to be satisfied, yet only 31% feel this way. Toronto and New York—May 23, 2017—Bond Brand Loyalty, a leading brand loyalty agency, today released its seventh annual consumer loyalty report. The Loyalty Report 2017 finds that loyalty programs remain one of the biggest drivers of brand choice and loyalty. Brands continue to invest more in loyalty programs, and enrollment has grown by 31% over the last four years. Despite success, opportunities to drive business results are still being missed. As customer experience increases in importance for consumers, evidence shows that Loyalty Program operators will be able to buy down the points or cashback dividend associated with their Program by providing better and more tailored member experiences. Based on data from the 2017 Loyalty Report, Bond has machine-learned and developed a proprietary tool to understand how certain member experiences and softer benefits can be introduced to offset the need to offer ever-richer dividends. This is key for Program operators, especially in payments, who need to reduce their program’s cost per point. The Loyalty Report 2017, conducted in collaboration with Visa, is the largest study of its kind. The report captures responses from more than 28,000 consumers in the United States and Canada, collecting feedback on more than 400 programs on 50+ attributes of loyalty programs, including rewards and redemptions, program and earn mechanics, brand alignment and emotional and behavioral loyalty outcomes, as well as human-to-human and digital experiences. Program enrollment continues to rise, with the average number of programs a consumer belongs to growing to more than 14 from 10.9 memberships from just 3 years ago, yet members actively engage with only half of those memberships. These findings also reveal the Golden Rule of 7—this is the number of active program memberships that consumers have the appetite and capacity to handle. Brands have work to do to ensure that they are one of the chosen programs. Investments in loyalty programs continue to increase, but program Member satisfaction remains steady year over year at about 46%. If spend is increasing, but satisfaction is staying the same, changes must be made to the overall experience of the program. Program satisfaction is highest in payment cards and retail such as gas/convenience, grocery and warehouse. It is lowest in telco services, apparel, automotive OEM and services and consumer packaged goods—though they hold great potential, except for coalition. Marketers are spending more to maintain program member satisfaction, and programs are highly effective with 81% of consumers agreeing that loyalty programs make them more likely to continue doing business with a brand. Holding steady from last year—76% of members say that programs are part of their relationship with brands, and 67% of consumers modify the brands they purchase to maximize the benefits they earn. The study found that 73% of members are more likely to recommend and say good things about brands with good loyalty programs (making loyalty programs great tools to improve NPS (Net Promoter Score), advocacy, and referral), while 66% report modifying spending to maximize point accumulation. *Note that there are important distinctions and changes in drivers, sector by sector. Most brands are not treating their best customers best. Only 22% of members say they are treated better than customers not enrolled in the program. Within this 22%, overall program satisfaction is 3.4 times higher than those who do not sense that they are treated better as a Program Member. Members who agree that a program is enjoyable are 10 times more likely to be satisfied. There’s lots of room to do better as just 29% of members agree that the program improves their experience with the brand. 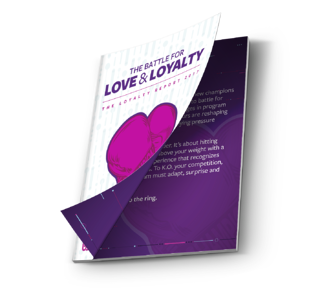 27% of program members say they have a consistent experience across each point of interaction with the brand (e.g., online, by email, by phone, in person), and only 3 in 10 members strongly agree the loyalty program experience is consistent with what they have come to expect from the brand. The human touch is a critical component of a successful loyalty program experience, yet only 22% of program members strongly agree that program representatives consistently make them feel positive emotions, and only 21% strongly agree that these same people improve their understanding of the program, including how it works and the benefits. More members than ever are enrolling digitally, with online enrollment accounting for more than one-half of new memberships. 57% of members want to interact with loyalty programs via mobile device; however, 52% of members don’t know if an app exists for their programs. Redeemers are twice as satisfied with loyalty programs as non-redeemers; yet more than one-fifth of program members have never redeemed. Results show that the redemption experience—the anticipation of reward, as well as ease of redemption—is more important than the actual reward. Of the 66% of members who have set a redemption goal, overall program satisfaction is 11% higher compared to members with no redemption goal. Marketers can increase member satisfaction by helping them set targets and track progress, including points total and value. Surprisingly, 57% of members do not know their points balance, and 38% are unaware of their points value. Satisfaction peaks as participants become eligible for rewards and drops off following redemption, making it important for operators to minimize time between redemption periods and progress towards the next redemption quickly. Redemptions have the most pronounced impact on satisfaction in drug store retail, where 41% more redeemers than non-redeemers are satisfied. Conversely, redemption is driving the lowest difference in satisfaction between redeemers and non-redeemers in consumer packaged goods, co-brand airline, private-label credit cards and bank branded points programs. The Loyalty Report 2017 performs in-depth profiling of more than 400 loyalty programs across key sectors including retail, payments, grocery, gas, dining hotel, airline, entertainment and coalition. Some of the top loyalty programs based on overall member satisfaction include: Amazon Prime, Southwest Airlines Rapids Rewards, Hilton HHonors, Costco Executive Gold Star Membership, Kohl’s Yes2YouRewards, Kroger Fuel Rewards, Walgreens Balance Rewards, Cabella’s CLUB Rewards, Carters Rewards, Sheetz My Sheetz Card, Papa John’s Papa Rewards and Panera MyPanera. For more information about the complete Bond Loyalty Report 2017 and to download a free copy of the Executive Summary, visit www.bondbrandloyalty.com/loyaltyreport. Bond Brand Loyalty is a management-owned agency that specializes in building brand loyalty for the world’s most influential and valuable brands. Our mission is to make marketing more rewarding for customers, richer and more resilient for brands, and more profitable for our clients. We build measurable, authentic, and long-lasting relationships through a combination of services that includes loyalty solutions, customer experience, marketing research, customer analytics, live brand experiences, and proprietary loyalty technology platforms. Visit our website, follow us on Twitter or contact us at 1-844-277-2663. For the Canadian Edition of this release, please click here.